Published in Tuesday’s Daily Titan. It’s October and the presidential election is in full swing. We watch as President Barack Obama and Gov. Mitt Romney debate, cheering our respective candidate while blotting out the other. And soon, perhaps during last night’s presidential debate, undecided voters must make their final decision with the election only 16 days away. Not me. I’ve already made my choice. I was undecided until early October, but while watching the first presidential debate, it came to me in a spark of inspiration. I’m voting for Captain America. Yes, the Marvel Comics superhero who wields an American flag shield. Don’t get me wrong: I think both candidates are OK. I’ll even concede that Obama has a trustworthy face. I just have a complete lack of faith in the political system, that’s all. 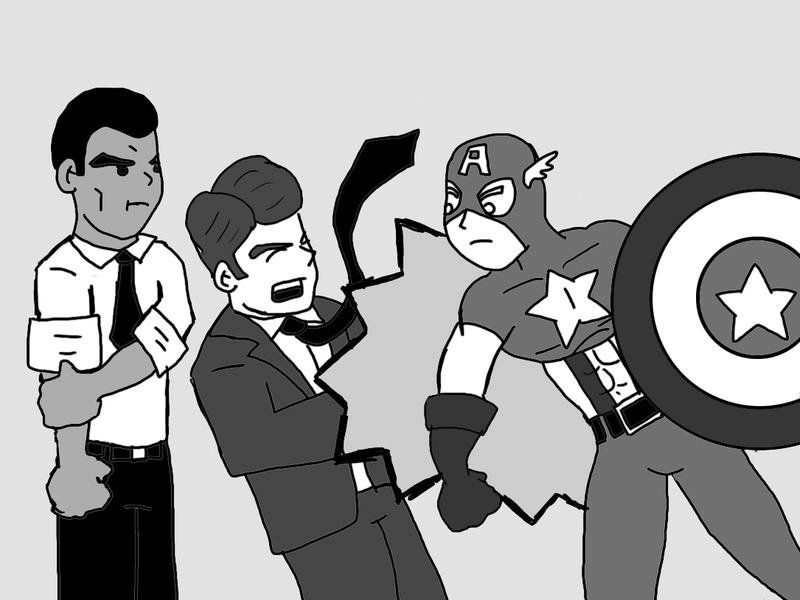 If Captain America has a problem with you, he will tell you outright why you are lying. Some shield throwing and punching may be involved. For example, in the mid-2000s Civil War storyline, the American government forces all superheroes to register to the government with the “Superhero Registration Act.” Seeing this as a tremendous overstepping of government authority, Captain America vehemently rejects this unjust law. Since he is breaking a federal law, a group of U.S. special forces agents surround him with guns drawn. His response? “Weapons down or I will not be responsible for what comes next,” he says. Romney couldn’t even summon that amount of backbone in his dreams. Captain America stays away from politics, but he knows when his country has its priorities in reverse. In s #128 (1970), he comes across a Vietnam-era university protest with students rioting against police officers and an “aloof” college dean. “Here’s where I oughtta step in and make like a swingin’ hero! But how do I know whose side to take? What the heck—the cops don’t need any help—but these kids do! !” he says. In 1974, months after the conclusion of Watergate, Captain America discovers that a high-ranking government official (assumed to be President Richard Nixon) is working for an evil terrorist group. He promptly rejects the U.S. and calls himself the Nomad. Captain America’s fans have always been attracted to his courage. Beyond his suit he is, after all, Steve Rogers, a scrawny young man who was not able to get drafted into the army during World War II. But his determination makes him the perfect candidate for the “Super-Serum.” He’s the target of bullies, the underdog, and he brings this into his role as Captain America, where he now has the strength to fight for the underdogs. “I am not a ‘superhero’… I am a man of the people. Together, you and I will identify and confront America’s problems. Together, we will figure out what we are and what we can be. Together, we will define the American Dream and make it an American reality,” he said. He’s an idealist who is not bogged down by a political party. He doesn’t campaign in swing states, he goes out and fights evil. But these issues are all chump change compared to the real reason why Captain America deserves the leader of the free world honors. On the cover of his first-ever comic book appearance, in March 1941, only months before the attack on Pearl Harbor, Captain America is shown doing something extraordinary. He is decking Adolf Hitler in the jaw.